This is the oldest of the two fledgling age vultures in our backyard. I think it is pretty cool that we can see clean through its nose. 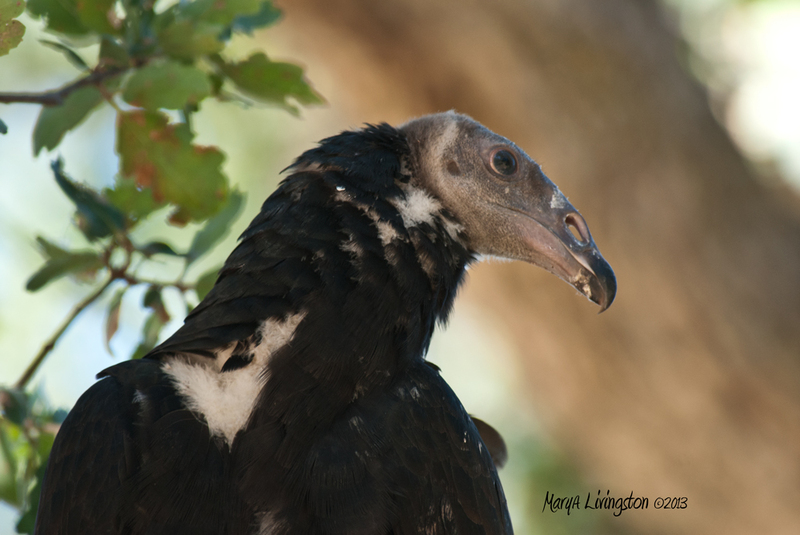 This vulture fledgling let me get pretty close yesterday. It has been spending most of the day out of the hole, up in the tree, while its younger sibling still retreats to the nest cavity. It is the oldest and the boldest of the two. I don’t know for certain, but it is about a day or two older than its sibling. I believe it has embraced being the oldest with a certain measure of bliss. I have been reviewing the video recording from the vulture nest cam. WOW! This eight week old turkey vulture chick makes the long climb out of the nesting cavity. The hollow of this oak tree is 14 feet deep. The second chick makes its appearance the next day, it will take some time for me to pull the footage. When I get it done, I will post it here. This is like watching a baby take tentative steps. Bliss.